New song: Cackling 'round the Cauldron! I made you a new song for "Halloween" this year! This is a digital release only, available as of Friday, September 18, 2009. Publisher NetManagement FZE / NMMV (NetManagement MusikVerlag) sabotages Frightdoll's Official Music Video for Alone in This. Please see September 14th, 2009 entry in the blog for details. Debut for the "Alone in This" video gets featured article on Fearnet! Review of Assimilation Illusion posted on synthpop & electronic music magazine ReGen. Review of Assimilation Illusion posted in German on alternative music webzine Terrorverlag. Review of Assimilation Illusion posted on industrial music magazine Side-Line. Review of Assimilation Illusion posted in Italian on Darkroom Magazine. Empusa has done a killer remix of the Frightdoll & Empusa collaboration song Unpreventable (the illusions mix) and we know you're going to enjoy it. Feature article on Assimilation Illusion posted on FEARnet. Review of Assimilation Illusion posted on Chain D.L.K. 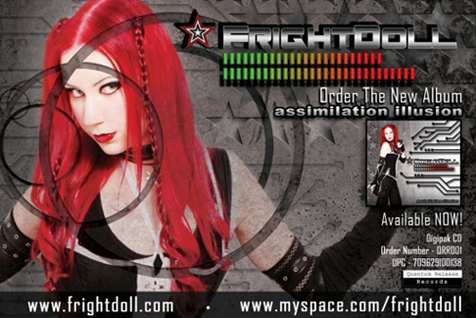 Frightdoll's 2nd album, Assimilation Illusion, is exclusively released through Quantum Release Records! Check out the shop section for more info. 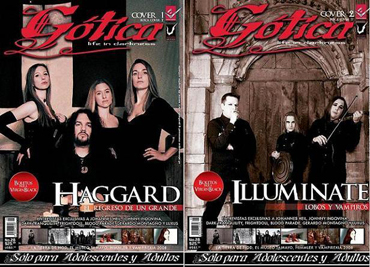 MEXICO: This month's issue of Revista GÓTICA (No. 28) features a new Frightdoll interview in Spanish. Check out this month's Artist Spotlight on ReGen Magazine for a new Frightdoll article! Music for a worthy cause!!! Machines Against Hunger is a compilation put together by Sigsaly Transmissions Media in which 100% of the profits from the sales of this double CD will be donated to the international aid organization: "Action Against Hunger"